Hair loss affects men and women. It affects them physically and psychologically. If you are experiencing hair loss, ask yourself whether you need to take action? Early detection and treatment is critical in the control of hair loss problem. What are the first signs of hair loss? Signs include receding hair line, thinning hair on the top of the scalp, and a finer, thinner hair texture. The Mixture assists to reactivate and revitalize shrunken hair follicles, increasing their size. While you continue to use The Mixture, follicles gain greater volume, their growing phases become longer and they produce longer, thicker hairs. This is counter to what people who suffer with male pattern baldness experience. Usually as males get older their hairs slowly become thinner as their follicles shrink, The Mixture works to counteract this. 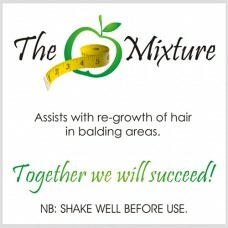 Should I use The Mixture even though I am not experiencing hereditary hair loss? The Mixture should only be used if you are experiencing hereditary hair loss. In other words if there is a history of hair loss in your family (on your mother’s or father’s side) then there is hereditary hair loss in your family. If you are losing your hair for any other reason (medication, stress, illness etc. ), we recommend that you consult your physician. The Mixture has to do a lot of work on and in your scalp before you will begin to see anything different on top (ie: hair). In the beginning you will need to realize that your follicles are ‘seeing’ results, even if you are not. 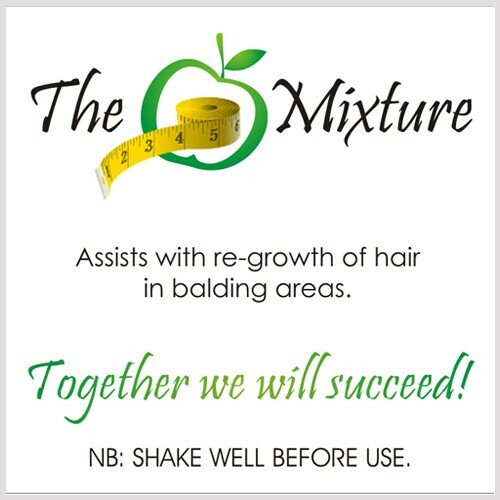 While The Mixture works hard on your scalp to re grow hair it is important to realize that The Mixture can help stop further hair loss by revitalizing and stimulating hair follicles. During the first two weeks you may lose or shed more hair than usual. This will be especially true as follicles make way for new growth. After the first two weeks you may start to see results. The Mixture makes miniaturized follicles larger and prolongs the growth phase of your hair’s natural growing process and increasing the number of active follicles in this phase. Eventually new growth may appear as soft, almost clear hair which is another sign that Te Mixture is actually working by stimulating growth. Eventually those clear hairs may grow to normal length size and color that you are accustomed to. Remember this, everyone is different. Some people notice results in 2-4 weeks but to see your best results it can take six to eight weeks.